Please note Due to some technical problems we are unable to provide these CD's for Sale at this time. If you love scrapbooking you'll love the graphics CD from Unicorn Designs. 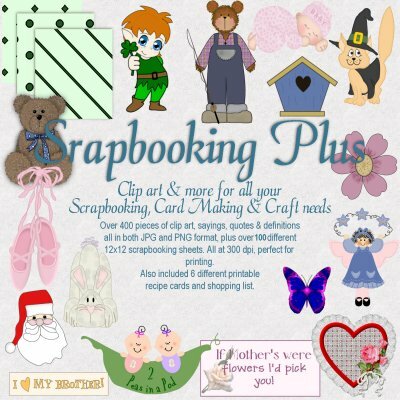 "Scrapbooking Plus", with over 400 pieces of clip art, sayings, quotes & definitions it's perfect for all of your scrapbooking, card making and craft needs. Or for those who like to share their scrapbooking pages with family and friends on the internet try Unicorn Designs great digital scrapbooking kits on CD.There are 12 different scrapbooking kits on each CD. Alone each digital kit sells for $3.50, for a total of $42.00 for all twelve. But purchase the CD's at $20.00 each and you save $22.00 We're sure you'll love them all, and your purchase is made easy and secure using Paypal! $20.00 - Scrapbooking Plus CD! Clip art and more for all of your Scrapbooking, Card Making & Craft needs. This CD includes over 400 pieces of clip art, sayings, quotes & definitions in both JPG and PNG format, plus over 100 different 12x12 scrapbooking sheets. All at 300 dpi, perfect for printing.Your purchase is made easy and secure using Paypal. Once confirmation of your purchase and payment is received from Paypal we will e-mail you with the shipping details. 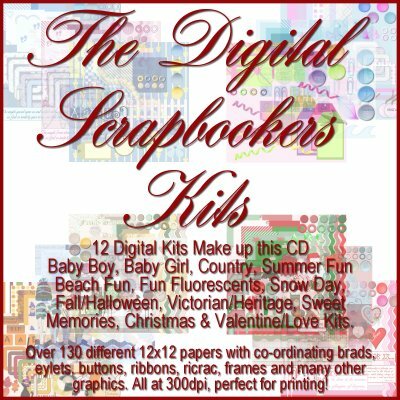 $20.00 - The Digital Scrabookers Kits CD includes 12 of our most popular digital scrapbooking kits as shown above. The kits included are Baby Boy, Baby Girl, Country, Summer Fun, Beach Fun, Fun Fluorescents, Fall/Halloween, Snow Day, Vicorian/Heritage, Sweet Memories, Christmas and Valentines/Love Kits. There are over 130 12 x 12 papers with co-ordinating brads, eyelets, buttons, ricrac, ribbons, frames and other embellishments. All items are made at 300 dpi, perfect for printing. Papers are in JPG format and all others are in PNG format (transparent backgrounds). These items are sure to add that finishing touch to all of your digital scrapbooking pages! 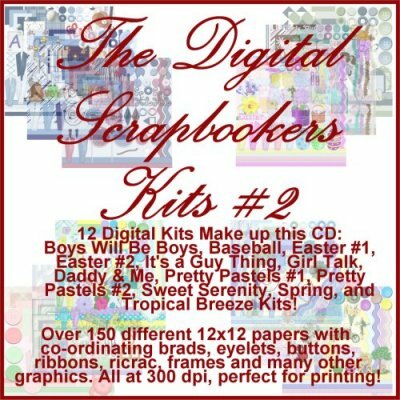 $20.00 - The Digital Scrabookers Kits CD #2 includes 12 more of our most popular digital scrapbooking kits as shown above. The kits included are Boys Will Be Boys, Baseball, Easter #1, Easter #2, It's a Guy Thing, Girl Talk, Daddy & Me, Pretty Pastels #1, Pretty Pastels #2, Sweet Serenity, Spring and Tropical Breeze. There are over 180 12 x 12 papers with co-ordinating brads, eyelets, buttons, ricrac, ribbons, frames and other embellishments. All items are made at 300 dpi, perfect for printing. Papers are in JPG format and all others are in PNG format (transparent backgrounds). These items are sure to add that finishing touch to all of your digital scrapbooking pages!